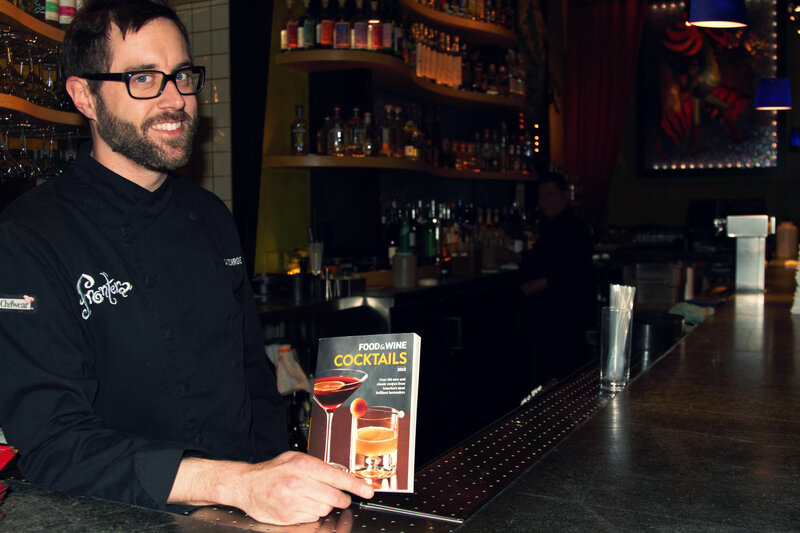 We’re toasting the forthcoming release of Food & Wine’s 2015 Cocktails book, which features recipe contributions from our very own mixologist and bar manager Jay Schroeder. “They reached out and asked me about agave spirits cocktails, that’s kind of my forte, so I went ahead and sent some recipes out to them … I used some different spirits and some things that I think are up-and-coming and deserving of a lot of recognition, but also made sure the cocktails were really approachable for those making them at home,” he said. No surprise, those spirits are featured prominently in Frontera’s bar program, where he creates inspired, seasonal cocktails that routinely impress our guests — just look at this cocktail menu — and in the pages of Food & Wine’s glossy recipe book, which contains more than 150 drink recipes supplied by 25 of the nation’s “rising star” mixologists. Pour the beer into a large chilled wine glass. In a cocktail shaker, combine the tequila, panela syrup and lime juice. Fill the shaker with ice and shake well. Strain into the wine glass and garnish with the orange twist. In a medium saucepan, combine 10 oz. chopped dark panela (aka piloncillo or unrefined cane sugar), 1/3 cup peeled and chopped fresh ginger, 2/3 cup water, 2 tsp. ancho powder, 1 1/4 tsp. whole cloves and the zest from one orange. Simmer over moderately low heat, stirring occasionally, until the canela is dissolved and the syrup is very fragrant, about 7 minute. Let cool, then pour through a fine strainer into a jar. If desired, strain the syrup again through cheesecloth to remove any residual ancho powder. Refrigerate for up to two weeks. Makes about 8 oz.